Not everyone in the meeting has a iPad. Some come to the meeting with… pads of paper and pens. OK, we admit it, many of us iPad owners still use paper too. 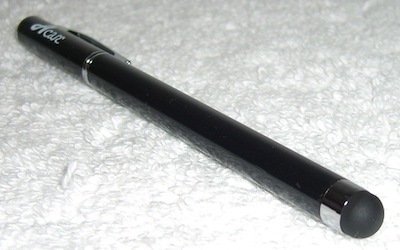 That said, we need a iPad stylus for handwritten notes and sketches, as well a ball point pen for writing on paper. Both in one would be nice, we aren’t looking to dust off dad’s old pocket protector to carry multiple writing devices. Acase heard us and has introduced a two in one pen! We have a couple in our hands, and as advertised, we only need one writing device in our pocket now! This isn’t the first Stylus and Pen combo device, but the others where with the hard tips for the Palm devices and not the conductive material for the iPad. Usually, they were little short pens that where great in the pocket but hard to write with long term. The Acase 2 in 1 has a nice weight and is the correct length to be used as a real writing device. The stylus side of the Acase 2 in 1 is the nice smooth fabric like material that writes nicely on the iPad screen. A regular pocket clip is attached for easy carrying. We tried and have yet to find a way to use the clip to attach the pen directly to the iPad2 cover from Apple. 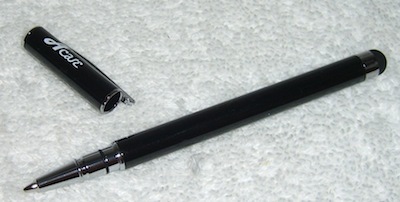 Remove the cap (end with the clip) and a regular ball point pen is available. The pen is a standard size so refills look easy to get. Several folks were going to hit the store on the way home last night to see what other type of pen tip refills will fit. The only real negative found with the Acase 2 in 1 is that the ink pen cap doesn’t fit over the iPad stylus end when your using it for paper writing. So, you have a little cap to keep track of. Short answer is use it as your iPad handwriting stylus and you have a pen for when a piece of paper gets dropped in front of you.